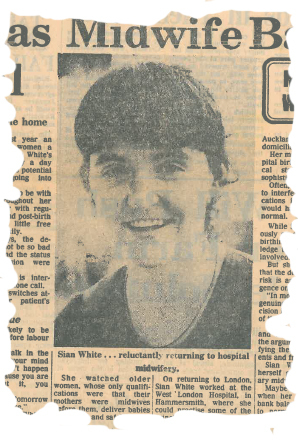 Sian Burgess (White) practised as a domiciliary midwife (and later an Independant Midwife) in Auckland, New Zealand from 1980 until 2004. She trained as a midwife in the UK in 1974 and, following some practice in Guys Hospital in London, Sian practised in Thailand for 3 years. She started domiciliary midwifery soon after the birth of her first child in 1980 (Banks, 2007, p. 74).